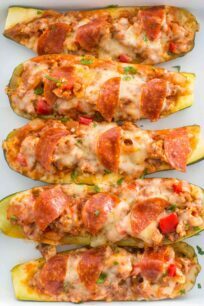 Pizza Stuffed Zucchini Boats are healthy, low carb, and a nutritious dish. The boats are stuffed with tomato sauce, cheese, sausage, and pepperoni, making them the ultimate comfort food. They are delicious, and perfect to get some veggies into your diet! We love utilizing zucchini in our dishes. Not only they are healthy and tasty, but they are also super easy to make. You can also check our Zucchini Lasagna Roll Ups and Taco Stuffed Zucchini Boats. Pizza Stuffed Zucchini Boats are super easy to make, and they taste like a real pizza. The difference is that you are getting a perfect grain-free alternative to one of the best foods on the planet! The boats are great as appetizers, side dish, main meal, or even as a snack. Kids and adults love them. Also, you can make them using your favorite ingredients, and experiment with the flavors. For example, you can use ground beef or ground chicken, instead of the sausage. These boats are also ideal for a vegetarian diet. Simply, substitute the meat with tofu or beans, and use vegetarian rennet cheeses. The best part of this meal is that it doesn’t take too long to prepare or to bake. On top of that, it is a perfect alternative to the traditional grain-based pizza. 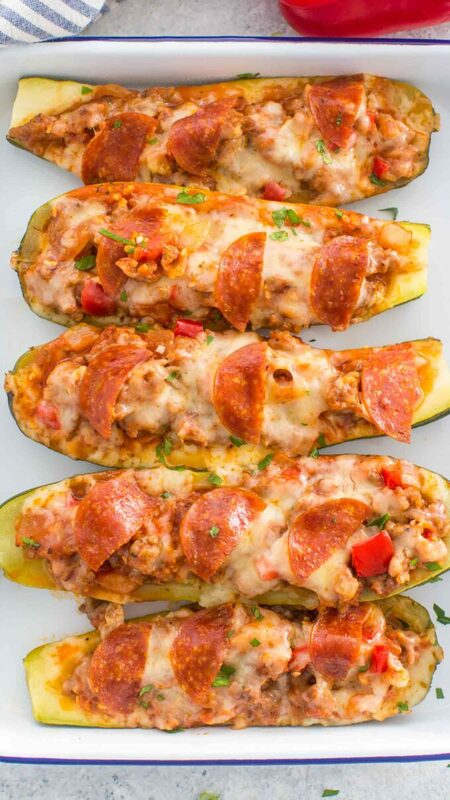 Are pizza stuffed zucchini boats healthy? They are considered a healthy alternative dish. Because the zucchini is a nutritious veggie, it has many benefits to consume it. For example, it was discovered that it can lower blood sugar levels, boost energy and contribute to weight loss. So we highly recommend incorporating it in your daily diet. For ultimate results, you should always consider mixing them with other healthy ingredients. CAN I USE SQUASH INSTEAD OF ZUCCHINI? Yes, you can. Yellow squash is a great alternative to many zucchini dishes including this one. However, you should note, that the taste of squash is different than the zucchini, so the dish won’t taste exactly the same. Also, the preparation of squash time is greater. This is because the squash is larger and taking much more time to cook. What do I need to make this dish? HOW DO YOU SOFTEN A ZUCCHINI BOAT? First, heat oven to 400°F. Line cookie sheet with cooking parchment paper. Rinse the zucchini, and pat dry with paper towel. Cut the zucchini in halves, and place skin down on the cooking sheet. Bake for about 15 minutes or until tender. Cool slightly. Cut them in halves, and place skin down on a microwave-safe dish. Cover the dish with microwave-safe plastic wrap or a lid. Cook them on high for four to 5-6 minutes. Remove the bowl from the microwave, and place the steamed zucchini on a plate. DO YOU EAT THE SKIN Of ZUCCHINI BOATS? Yes, you can eat the skin, and it’s quite delicious! In addition, this is the healthiest and most nutritious part of the meal and something that you should not throw away. Therefore, by all means, please enjoy them with the skin on. CAN I MAKE A VEGETARIAN OPTION? For a vegetarian option, simply replace the meat or pepperoni with veggies. There are many alternatives that you can use for stuffing, such as tofu and beans, are a great example of alternatives. CAN I FREEZE Pizza Stuffed Zucchini Boats? The zucchini boats freeze well for up to 3 months in the freezer. The only tip for freezing them is that they should be frozen in an airtight container or a zip bag. You don’t want the taste of frost in them. 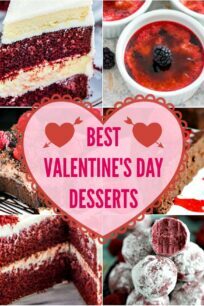 Reheating them in the oven is recommended for a better taste. 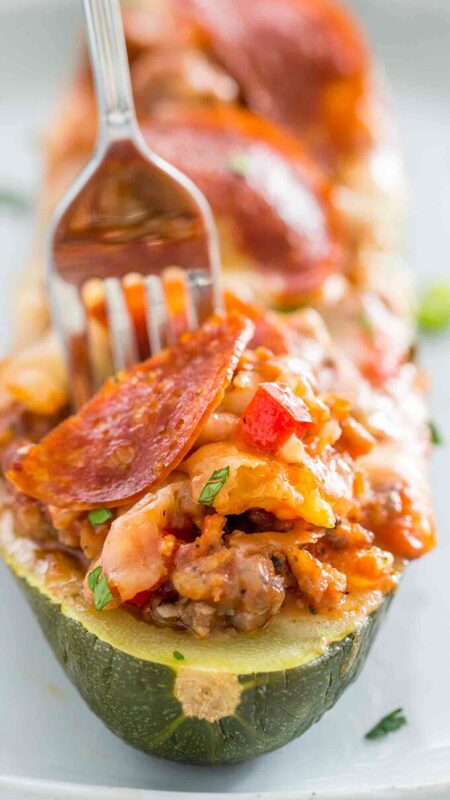 Pizza Stuffed Zucchini Boats are healthy, low carb, and a nutritious dish. The boats are stuffed with tomato sauce, cheese and pepperoni, making them the ultimate comfort food. Cut the zucchini in half and using a small spoon, hollow out the center out of the halves, leaving 1/4 inch thick shell on each half, to create zucchini boats. Keep only the flesh from two zucchini and discard the rest. Squeeze excess water out of the flesh and chop well. Set aside. Place a large skillet over medium-high heat. Add olive oil and once the oil is hot add diced onion and garlic, stir and cook for 1 minute. Push to one side of the pan. Add ground sausage. Using a wooden spoon, break it up while it cooks. Mix with the onion and garlic and continue cooking for about 5 minutes. Drain grease, leaving only about 2 tablespoons in the pan. Add the diced bell pepper, tomato sauce, tomato paste, diced zucchini flesh, Italian seasoning, salt and pepper. Stir well and simmer on low for about 15 minutes. Taste and adjust for salt and pepper if needed. Preheat oven to 400 degrees F. Line a baking dish with foil, to avoid cheese sticking to it, and set aside. Using a spoon, scoop the sausage mixture into the hollowed zucchini boats. Divide the mixture equally and press firm to fit in as much as possible into the zucchini boats. Arrange into a baking dish and top with shredded cheese and pepperoni slices. Cover with foil and bake for 25-35 minutes until cheese is melted and zucchini is cooked through. Remove foil during last 5 minutes of cooking. I DID NOT know that zucchini can lower blood sugar levels, boost energy and contribute to weight loss. But I am even more excited that we can substitute the zucchini for squash because of we have tons of squash during the season! This is such a great idea! So easy and so many great flavors. 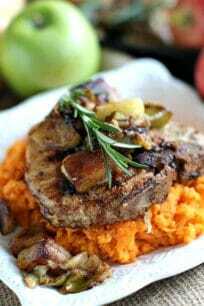 I’d love to make these for weeknight meals. These look fantastic and it’s something even the kids would really like!! 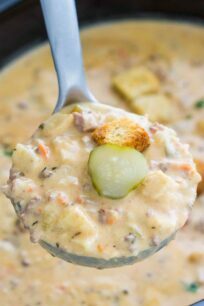 Such a yummy low carb recipe!! WOW!! This sounds amazing –you get your pizza taste, your veggie, and low in calories! This is one win-win-win for me. 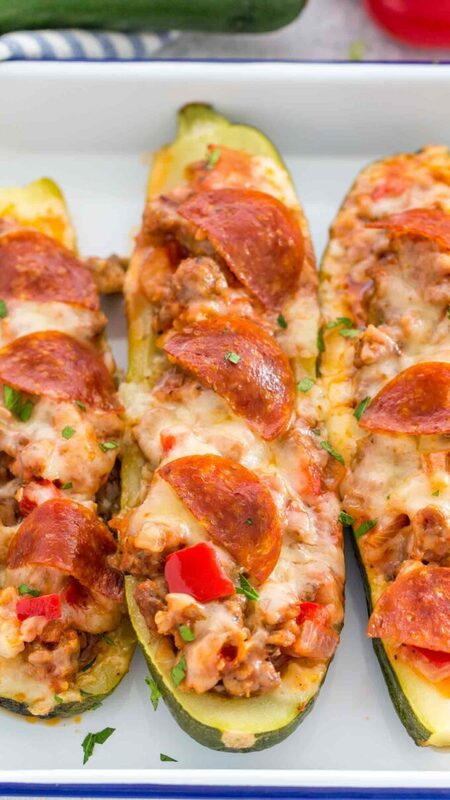 The Pizza Stuffed Zucchini would be fantastic as a satisfying lunch. I know our grandsons would get a big kick out of having this for lunch. I started to enjoy eating zucchini last year so this is a fun and great recipe for me to try! I also love the idea of trying it with spaghetti squash for a switch up. Love zucchini, love pizza so these two together is perfection! We really enjoyed this recipe! My husband wasn’t sure but he quickly agreed they were tasty. I added a couple finely diced mushrooms but other than that made them as written. I have printed about 90% of your recipes & now have an endless supply of dinner, breakfast & snack ideas! Thanks so much for all the work you put in. I love these for a light dinner option! I love this idea for stuffed zucchini! Can’t wait to try it!